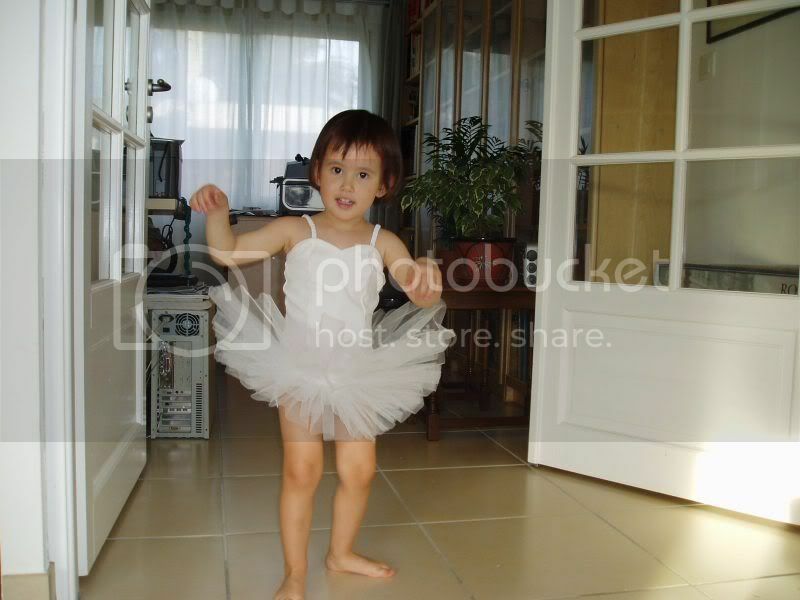 Across 2 Cultures - Cross-Culture Parenting and Lifestyle Blog: Little ballerina girl. Laetitia still at my in laws and yesterday I received a couple of photos from my mother in law on what went on during the day for them. She went to the library, played on the beach, danced in the house etc. Anyways, one of the photos is this! Isn't she cute? My very own little ballerina girl. My mum in law let Laetitia tried on Etienne's sister ballerina costume. I am always amazed at how she has kept most of the stuff from when Etienne and his sister were little. I mean, this ballerina costume is like 35 years old. It is a little big on her but I'm sure she will soon grow into it. And then, it'll be time to send her for some ballet class. Can't wait!